What’s not to love about bank robbers wearing piggy masks? Bring out your inner gangster with this bank-heist themed online slot where all the action’s at! This is a great pick for lovers of bank robber films like Ocean’s 11… and perhaps you’ll walk away with the goods just like in the movies! Sheriff Gaming presents this extraordinary online video slot. Think Ocean’s 11 meets Charlotte’s Web - the game involves bank robbers wearing pig masks, dressed in suits, holding up a bank. The cool background music seems reminiscent of a 1970’s bank heist movie or something sleek and classy out like in James Bond. Frankly, I was really impressed with the quality of the graphics especially for an online flash video slot. The game comes complete with a feature bonus game, multiplier bonus, wild symbols, Click Me Bonuses, and cool images of bank robbers in masks. Piggy Bank slot bonuses also feature the debut of a new Floating Multiplier Bonus feature, which is an innovative bonus that awards players with special multiplier bonuses on select reels and winning combinations. Think Ocean’s 11 meets Charlotte’s Web - the game involves bank robbers wearing pig masks, dressed in suits, robbing a bank. The cool background music seems reminiscent of a 1970’s bank heist movie or something sleek and classy out like in James Bond. When it comes to 3D online slots, you can expect the best in show, and Piggy Bank proves no exception. You can tell the game designers really put effort into creating a unique gaming experience with high-quality graphics. I love when the bank robber shoots off the machine gun after certain winning combinations. Even the “Spin” button looks like a female hostage with her hands behind her head that twists every time you click to spin the reels. 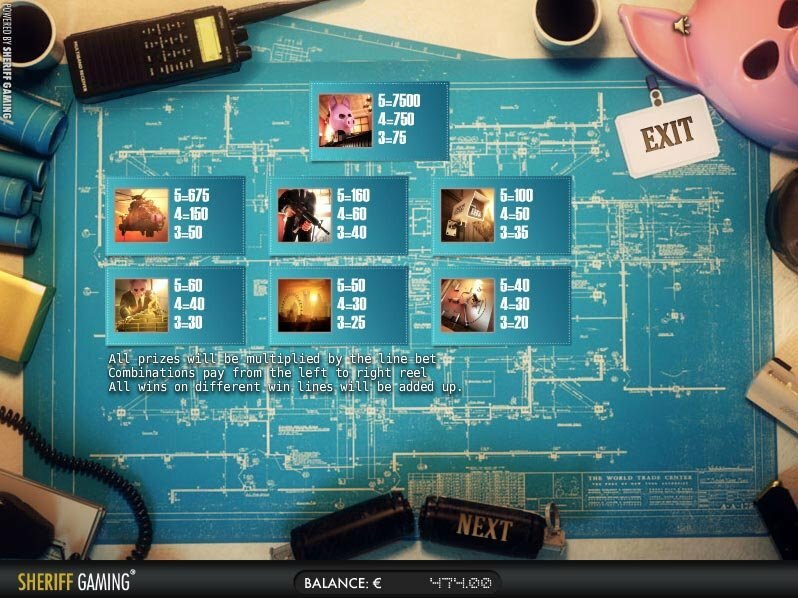 Every reel icon is themed around the heist; either at the bank, during the planning stage or post-event. These include criminals wearing pig masks, pigcopters (that is, a helicopter with pig mask), London, security cameras, safety deposit boxes, vaults, gold, security guards and grenades. I applaud the game designers for creating such a unique theme for a slot game paired with such well-designed game graphics. Be sure not to miss out on this one! 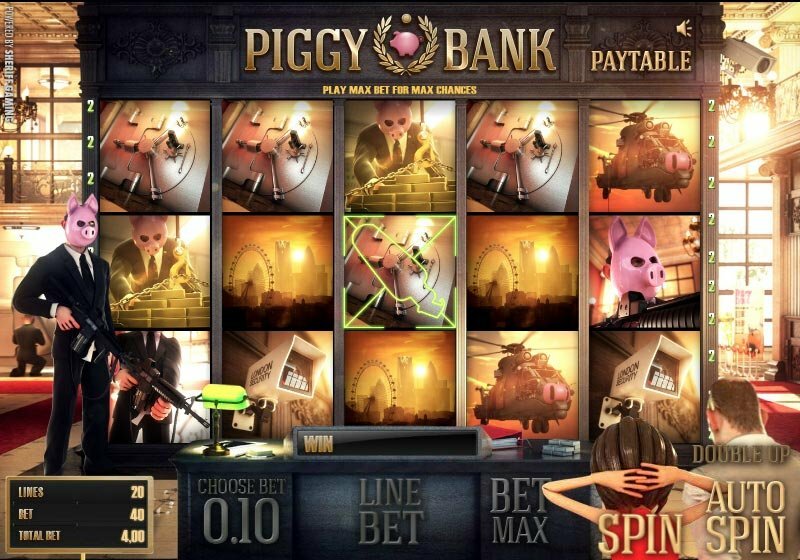 The Piggy Bank online slot aims to please with plenty of bonus features and icons. The security guard icon represents the wild symbol and can substitute for the pig mask, pigcopter, criminal, security camera, gold pile, London skyline, and vault door image. Piggy Bank Slot contains a multiplier bonus triggered when the hand grenade symbol lands on the middle position on reel 3 marked by the green target box. This automatically transforms three other icons into multipliers. These multiplying icons will remain on these spaces until a win and will be added to more multipliers if the feature triggers again before another win. The Piggy Bank Slot Bonus Feature activates a bonus game when 3 or more gold bar pile icons appear on the screen scattered. Then the crooks in piggy masks airlift their stolen loot from the vault and fly it to their secret hanger. In the bonus round, 20 different safety deposit boxes hide prizes of either credits or multipliers. Click on the items to reveal what prizes you’ve won until you’ve selected all 20 items successfully or until you choose the word “Collect”. These prizes will then automatically multuiply by the number of active win lines and the line bet. The game also includes a “Double Up” Round similar to a Gamble Round that gives you the chance to double every prize you win. When you win a prize, the Double Up feature activates. During the round, you can try to either double or quadruple winnings. To double your winnings, choose the whether the next card will be red or black. To quadruple winnings, choose the suit that you think will be drawn on the next card. But be careful! If you guess wrong you lose your bet! Three or more safety deposit boxes will trigger an on-reel click me style game. During this game, players must choose one of the locked safety deposit boxes and will receive a prize. You’ll also get to see what was hidden in the other boxes to see what you missed out on.